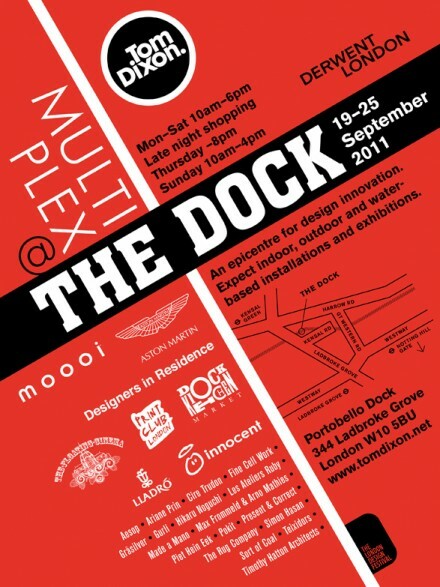 Art / Design Event / Design News / Street Art / Tom Dixon / Where I would rather be ! 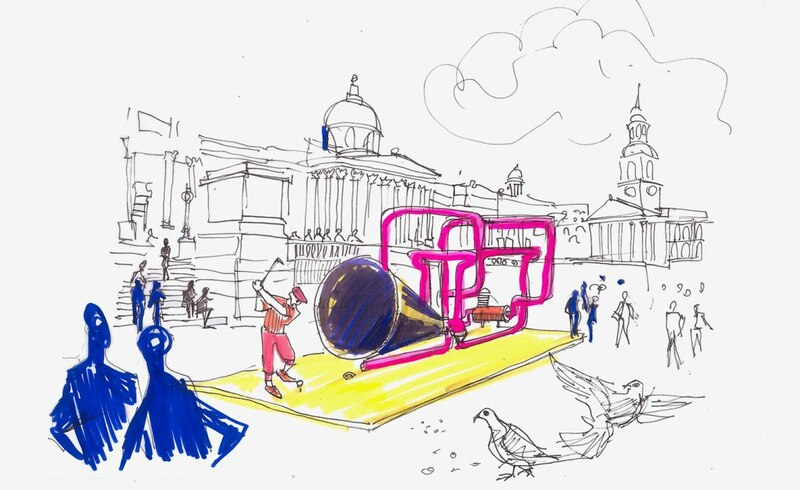 Supporters of this project will bring about a public takeover of Trafalgar Square, transforming it into a free, colourful and playful arena of Visionary Crazy Golf. It will attract a wide, public audience, and inspire the next generation of creatives. Thousands will be able to play the course, and millions more will watch and enjoy this experience, both in the square and through media. Each invited designer will create a miniature pavilion that makes an entertaining, playable statement about the future of architecture, filling the square with Pop Art colours and inventive forms that will amuse and inspire both adults and children alike. Festival audiences are significant, with an estimated direct audience of over 375,000 people from over 75 countries in 2015. 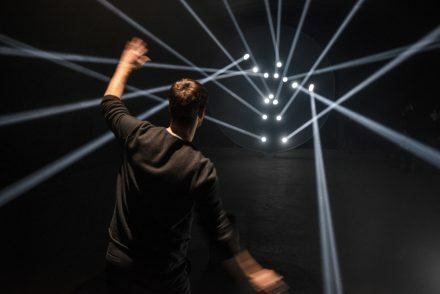 This will be the most ambitious of the London Design Festival’s decade-long tradition of interventions in Trafalgar Square, which have included a giant chess set and a light show performed by an assembly line of robots. These popular installations bring an awareness of design and its possibilities to the centre of the city and are enjoyed by millions of Londoners and international visitors. This project has been nine months in the making. 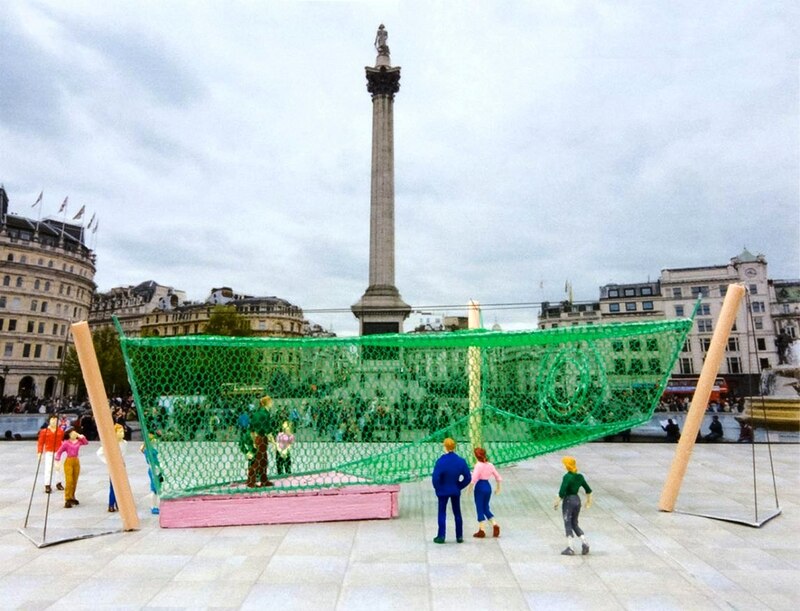 In autumn 2015, the London Design Festival organisers approached Paul Smith with an idea – what if we could turn Trafalgar Square into a giant crazy golf course ? Together, we brainstormed a list of the eight best creatives we could think of, and approached them to sketch out the crazy golf course of their dreams. 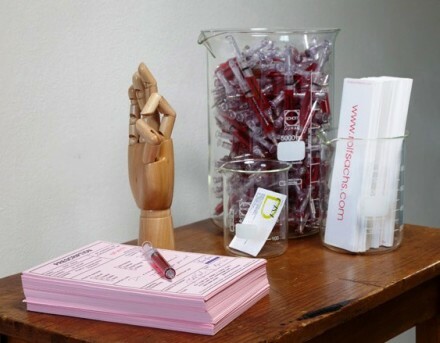 The designs went through feasibility studies until each artist, architect or designer finalised their vision. This is a project for the public, funded mostly by the public. Realising a project of this ambition and scale is expensive – we hope to raise half of the required funds through Kickstarter and will match-fund the rest through sponsorship. The Festival is actively seeking this extra support through its network of supporters. We want as many people as possible to have the opportunity to be directly involved in animating Trafalgar Square with Visionary Crazy Golf. If we fail to meet the Kickstarter target, unfortunately this project won’t be able to go ahead, so your support is crucial. We have secured permission from the Mayor’s office to use Trafalgar Square, and they are enthusiastic about this scheme. 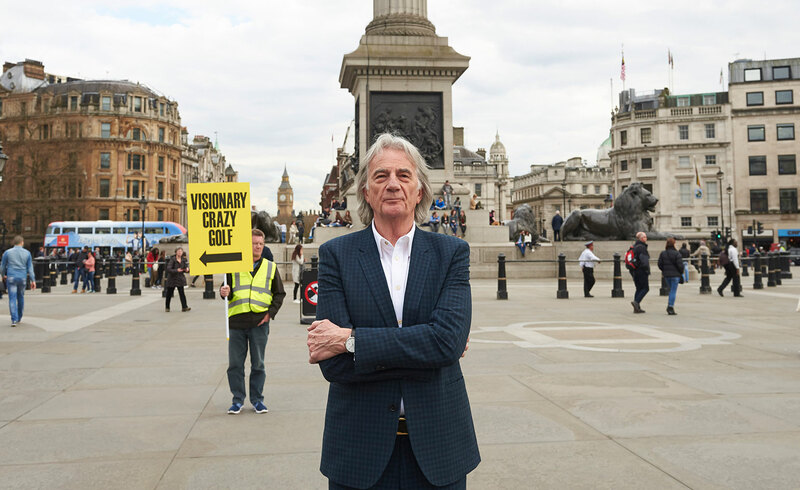 It is one of the few opportunities to use this prime location for cultural activity, and we are confident that there will be enough people who share Paul Smith and the London Design Festival’s enthusiasm to enable its success. 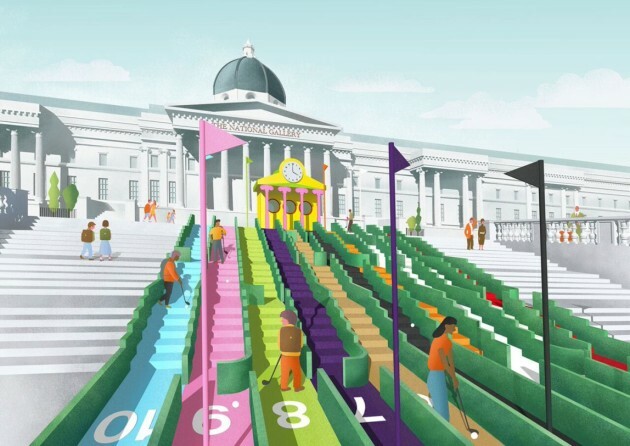 Paul Smith, curator and ambassador for the project, will transform the steps from the National Gallery into a riot of different coloured stripes, topped by a neo-classical clubhouse that echoes the museum, but has a turf roof and putters for columns. Paul Smith is Britain’s foremost designer and a taste-maker – a leader of British and international design trends. Famous for its clothing and accessories collections, Paul Smith specialises in an inventive use of traditional craftsmanship and cutting-edge design to create beautifully made, desirable, modern pieces. The late Zaha Hadid designed an undulating course with two levels that traces the shadow of Nelson’s Column. Zaha Hadid, founder of Zaha Hadid Architects, passed away on the 31 March 2016. She was awarded the Pritzker Architecture Prize in 2004, the RIBA Stirling Prize in 2010 and 2011, and the Royal Gold Medal in 2016. 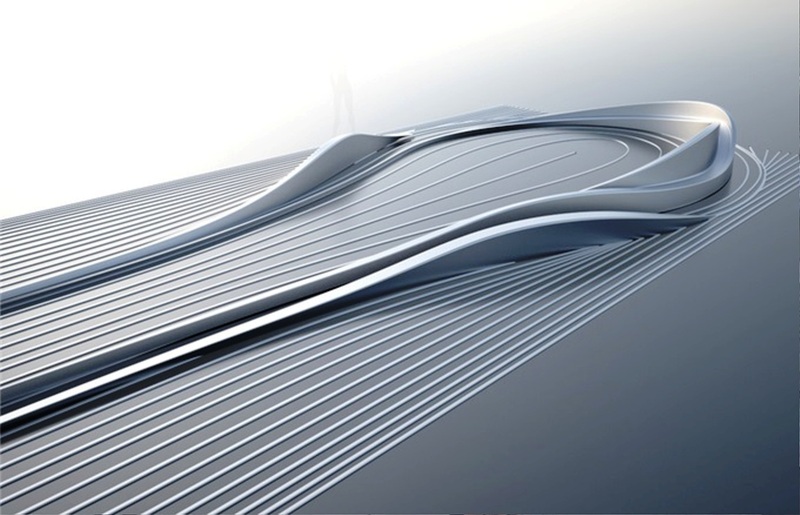 The London Aquatics Centre for the 2012 Olympics and the Heydar Aliyev Centre in Baku are built manifestos of Hadid’s quest for fluid space. Her pioneering vision redefined architecture for the 21st Century and captured imaginations around the world. Tom Dixon is an internationally renowned British Designer, Creative Director of eponymous brand Tom Dixon. His works are included in permanent collections of the world’s most prestigious museums, including the V&A and the MoMA. Tom Dixon has built his universe through intensely diverse experiences, from music, contemporary lighting, furniture and accessories to high profile projects including the Restaurant at The Royal Academy in London, Jamie Oliver’s restaurant, Barbecoa as well as Shoreditch House. 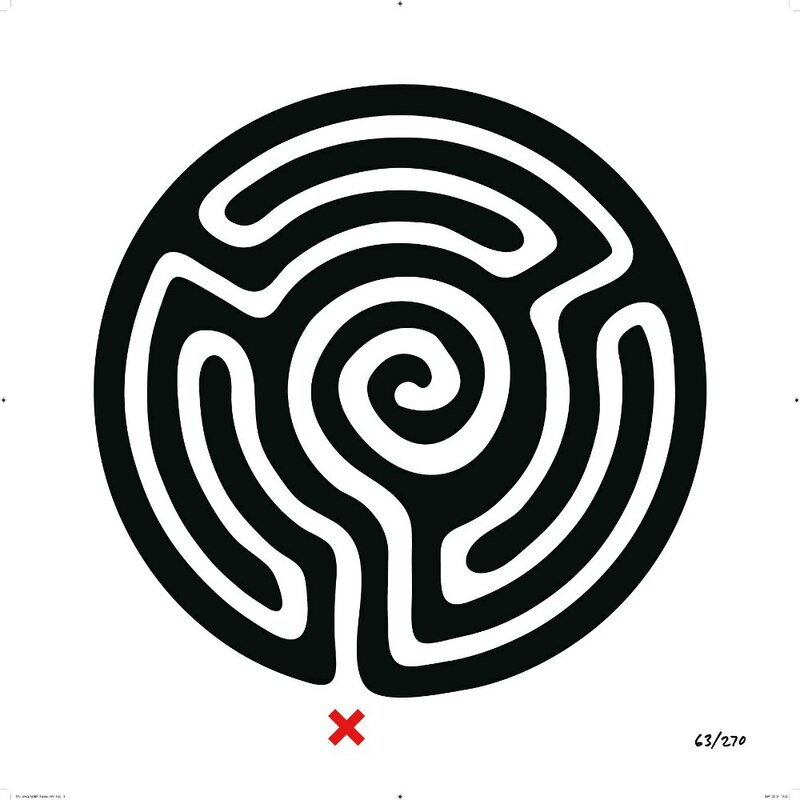 Mark Wallinger is one of the UK’s leading contemporary artists. 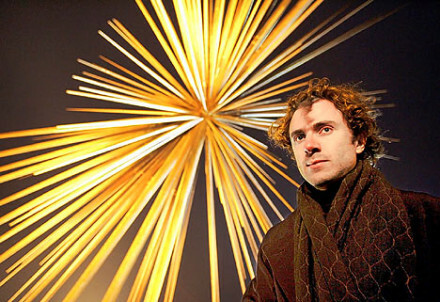 He was nominated for the Turner Prize in 1995, and won it in 2007 for his installation State Britain. Atelier Bow-Wow is a Tokyo-based firm founded by Yoshiharu Tsukamoto and Momoyo Kaijima, interested in architectural design, urban research and the creation of public artworks. The practice has designed and built houses, public and commercial buildings mainly in Tokyo, as well as Europe and the USA. 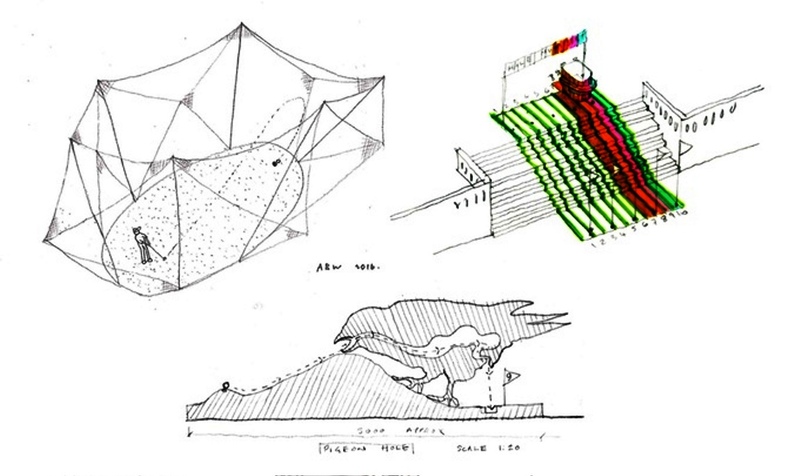 a cross-section by Ordinary Architecture of a giant pigeon, through whose gut golf balls will travel. Ordinary Architecture is a London-based design practice run by Charles Holland and Elly Ward. The practice’s name refers to an interest in popular culture and an architecture that draws inspiration from the ordinary and the everyday. Current projects include new rural housing in Wiltshire, an exhibition for the V&A at the Venice Biennale and public art projects in the UK and LA. Camille Walala began her design career in textiles, and now specialises in transforming objects and spaces with her signature blend of vibrant patterns, bold primary colours and optical illusion. 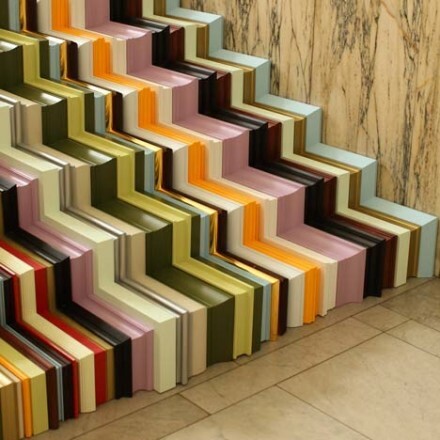 Her designs can be found adorning buildings across London, Sydney, New York and beyond. 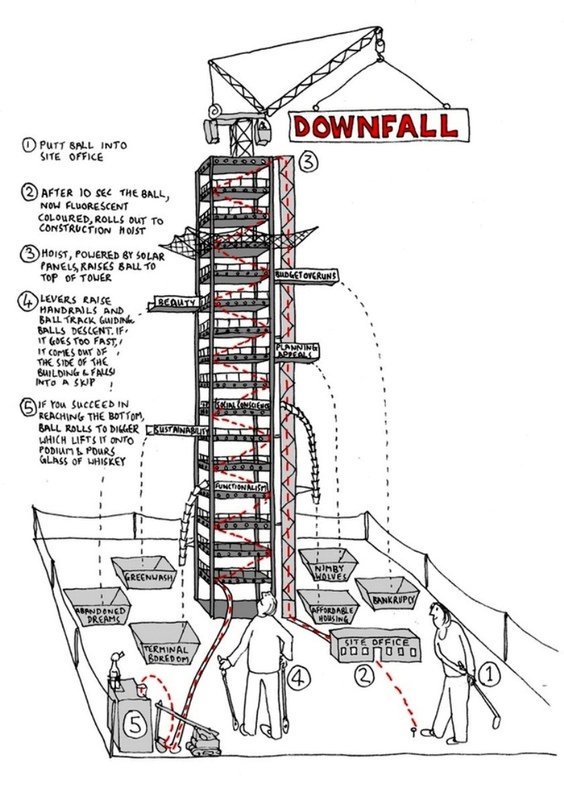 Hat Projects and Tim Hunkin explore functionality and lifecycle in Downfall. HAT Projects is an award-winning architecture practice led by Hana Loftus and Tom Grieve, with a particular focus on cultural and community projects. HAT’s notable previous projects include the RIBA Award-winning Jerwood Gallery in Hastings, Gasworks gallery in South London, and High House Artists’ Studios in Essex. 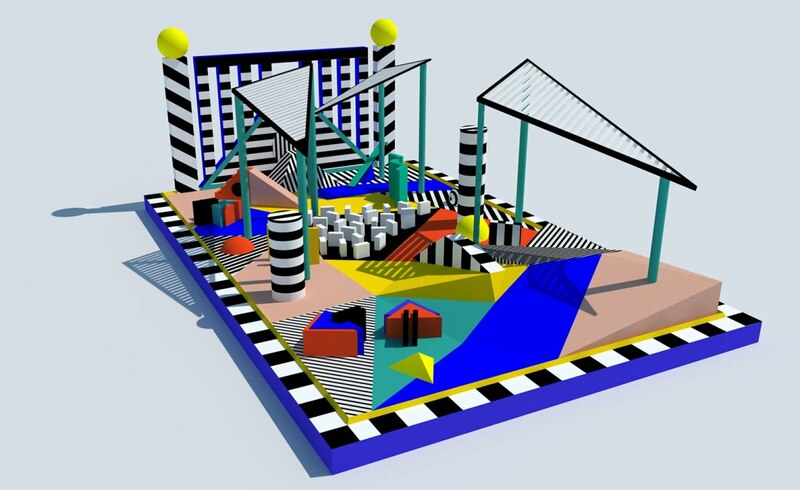 For Visionary Crazy Golf, HAT Projects are collaborating with London based engineer and artist Tim Hunkin, who is welll known for his large-scale and theatrical sculptural projects. 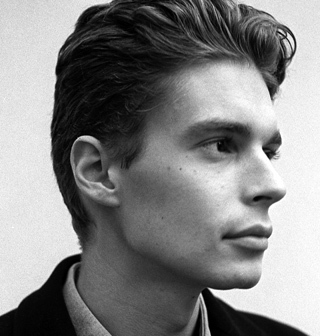 NEON, the award winning London based studio, is directed by architect Mark Nixon. The studio explores the intersection between architecture, design and art. NEON’s work is often designed to initiate an emotional response, to stop people in their tracks and to break the monotony of the everyday. The London Design Festival is a city-wide celebration of design that takes place over nine days every September. 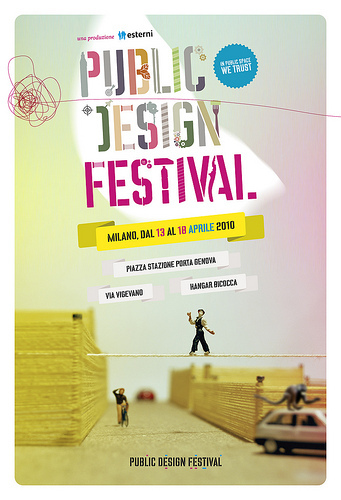 The Festival programme is made up of over 400 events and exhibitions staged by over 300 partner organisations across the design spectrum and from around the world. The Festival also commissions its own Landmark projects and interventions in public spaces across London. Previous Trafalgar Square projects have included The Tournament, a giant ceramic chess set designed by Jaime Hayón. We will show our gratitude by sending you a VIRTUAL HOLE-IN-ONE and list YOUR NAME ON OUR WALL OF FAME webpage. Receive DESIGNER DOWNLOADABLE WALLPAPERS for your phone, tablet, and laptop by graphic designer Camille Walala in her signature “Tribal POP” style. Plus your name on our Wall of Fame webpage. THE DOUBLE BIRDIE TWITTER PACKAGE. The London Design Festival will follow you on Twitter and send you a “thank you” tweet. Plus your name on our Wall of Fame webpage. Limited edition CRAZY GOLF SOCKS designed by the one and only Paul Smith. 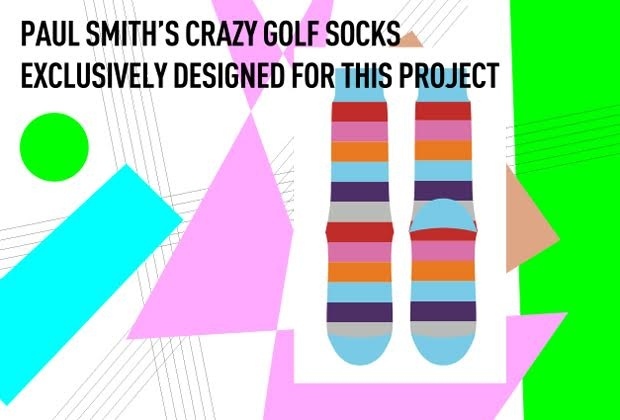 Smith is renowned for his ‘classic with a twist’ take on British styling, and these custom-made golf socks designed exclusively for the Visionary Crazy Golf project make no exception. Plus your name on our Wall of Fame. ENTER A POLL to name the most popular pigeon in Trafalgar Square – AND RECEIVE HIS NAME & FACE ON A MUG. 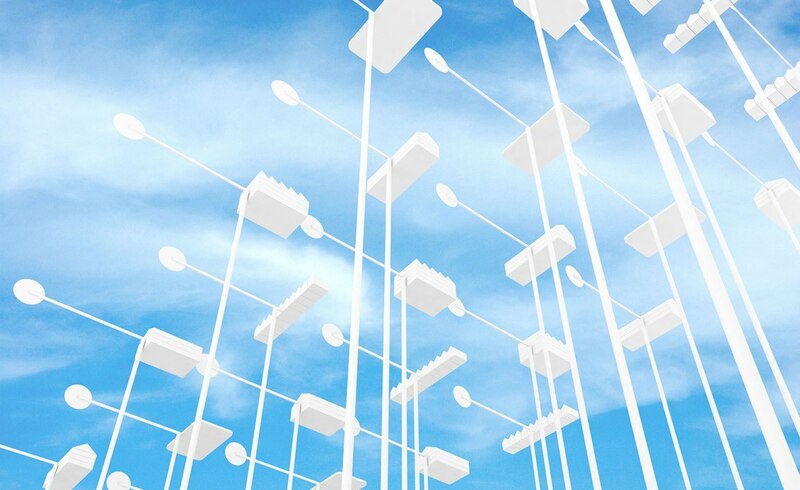 Submit a name for Ordinary Architecture’s larger-than-life “pigeonhole” in Trafalgar Square. 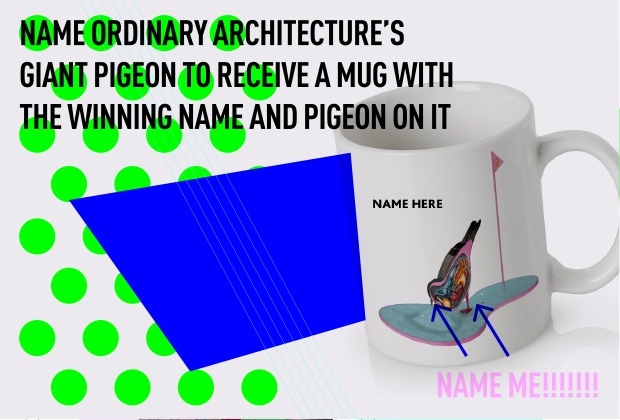 All backers will receive a pigeon mug with the winning name. A3 STUDIO PRINT OF YOUR CHOICE. 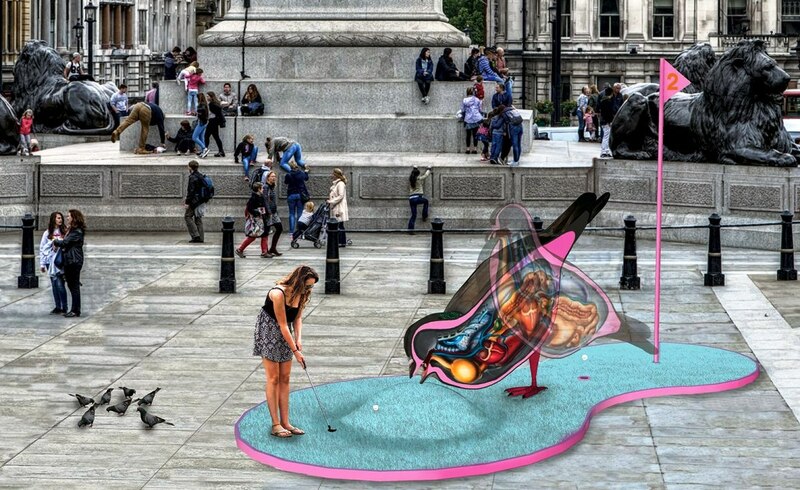 Pick from a selection of Visionary Crazy Golf Hole designs, beautifully captured as an archival digital print. Plus your name on our Wall of Fame. 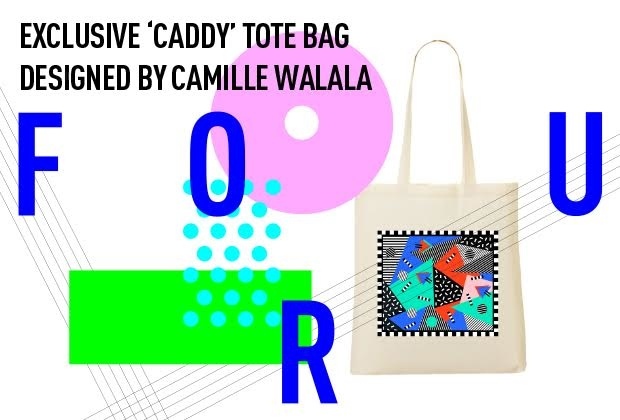 DESIGNER “CADDIE” TOTE BAG by graphic designer Camille Walala in her signature “Tribal POP” style. This quality canvas bag sports a design inspired by her Visionary Crazy Golf hole. Plus your name on our Wall of Fame. ONE EARLY “BIRDIE” TICKET. PRIORITY BOOKING. Book a PRIME TIME SLOT for this event (16th-22nd September). Your tickets will be booked AHEAD OF THE GENERAL PUBLIC so you won’t have to queue! Plus your name on our Wall of Fame. 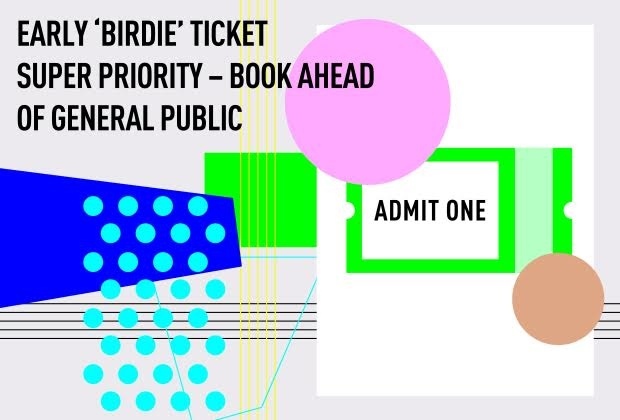 TWO EARLY “BIRDIE” TICKETS. PRIORITY BOOKING. Book a PRIME TIME SLOT for this event (16th-22nd September). Your tickets will be booked AHEAD OF THE GENERAL PUBLIC so you won’t have to queue! Plus your name on our Wall of Fame. 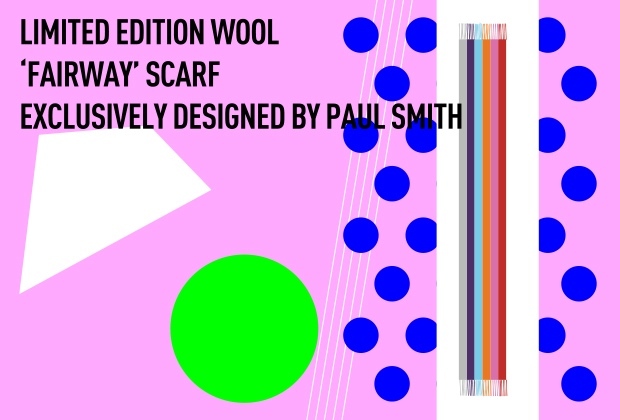 LIMITED EDITION “FAIRWAY” SCARF DESIGNED BY PAUL SMITH. Smith is renowned for his ‘classic with a twist’ take on British styling, and this custom-made wool scarf designed exclusively for the Visionary Crazy Golf project is no exception. Plus your name on our Wall of Fame. A3 LIMITED EDITION FINE ART PRINT SIGNED BY PAUL SMITH. An artist’s render of the Visionary Crazy Golf course in Trafalgar square, beautifully captured as a fine art print on Photo Rag paper and SIGNED by Paul Smith. Plus your name on our Wall of Fame. 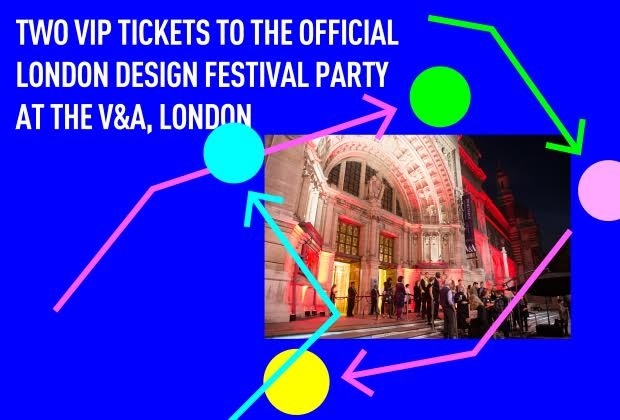 TWO VIP TICKETS to the London Design Festival’s exclusive annual party at the V&A (22 September). 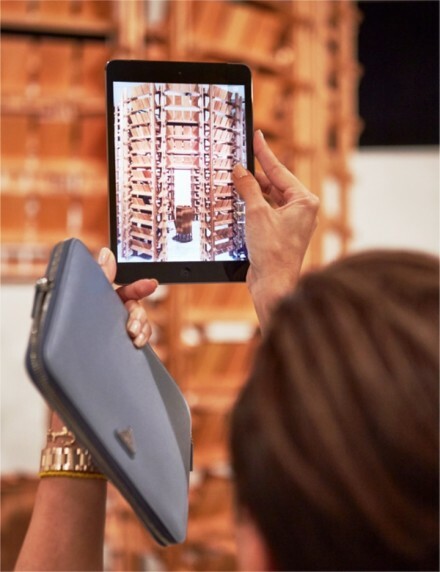 Tickets offer the chance to mingle with the world’s leading designers and industry leaders, and to view the London Design Festival’s installations after hours. The event also includes delicious canapés and an open bar. Plus your name on our Wall of Fame webpage. TEE OFF BEFORE THE REST with a round of Visionary Crazy Golf against the UK crazy golf CHAMPION, Richard Gottfried on the opening day. Are you ready for the challenge? Tee time at 18:00 on 16 September. Plus your name on our Wall of Fame webpage. 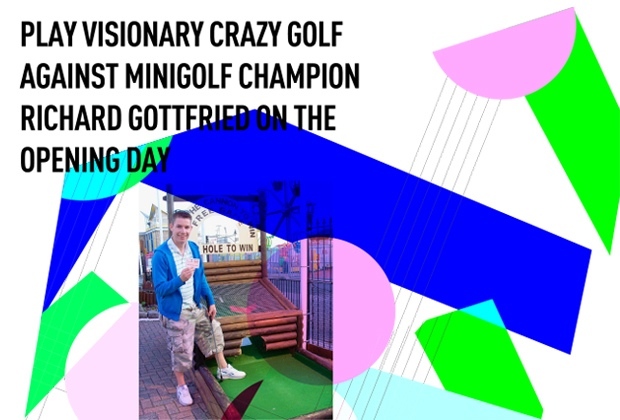 BECOME A VIP VISIONARY CRAZY GOLF MEMBER. 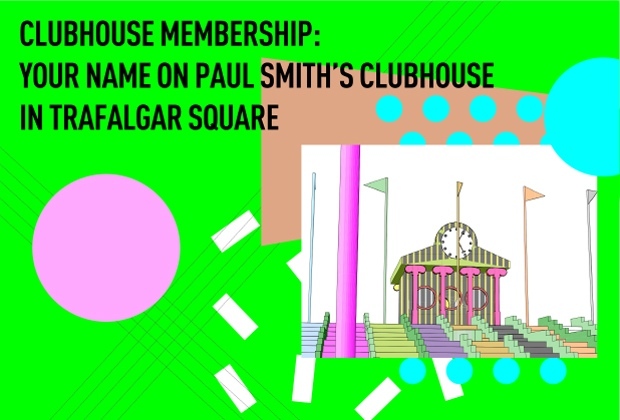 Have your name proudly displayed on PAUL SMITH’S “CLUBHOUSE” IN TRAFALGAR SQUARE. Plus TWO EARLY “BIRDIE” TICKETS to ensure a preferred tee time for you and a friend. PLUS your name on our Wall of Fame webpage. TEE OFF BEFORE THE REST with a round of Visionary Crazy Golf for you and a friend on the OPENING DAY. Tee times are on the afternoon of 16 September. Plus your name proudly displayed on PAUL SMITH’S “CLUBHOUSE” IN TRAFALGAR SQUARE and on our Wall of Fame webpage. Visionary Crazy Golf with MARK WALLINGER on the opening day. 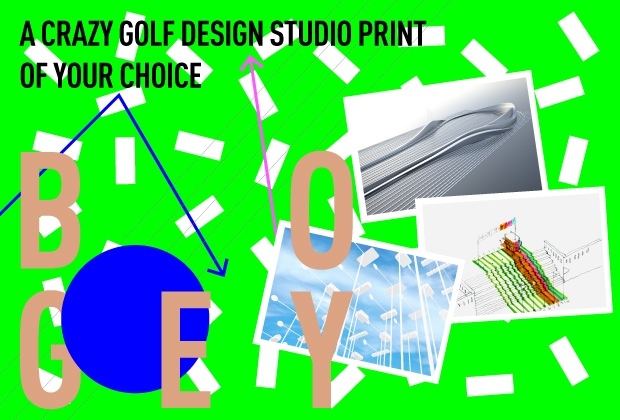 This is an exclusive opportunity to play a round with the master behind the award winning designs. Tee off at 14:00 on 16 September. Plus your name proudly displayed on PAUL SMITH’S “CLUBHOUSE” IN TRAFALGAR SQUARE and on our Wall of Fame webpage. MEET MARK WALLINGER AND TOUR HIS STUDIO. This reward offers the opportunity to meet Turner Prize winning designer MARK WALLINGER and take a tour of his studio with only five others. Tours will take place at a mutually agreed time the week of 25 September. Plus your name proudly displayed on PAUL SMITH’S “CLUBHOUSE” IN TRAFALGAR SQUARE and on our Wall of Fame webpage. TOUR ZAHA HADID’S STUDIO. Take an exlusive tour around the studio of award winning architect ZAHA HADID with the opportunity to meet her team. Tours will take place at a mutually agreed upon time and date the week of September 25. Plus your name proudly displayed on PAUL SMITH’S “CLUBHOUSE” IN TRAFALGAR SQUARE and on our Wall of Fame webpage. VISIONARY CRAZY GOLF CLUB “MEMBERSHIP” EVENT FOR TWENTY-FIVE. Enjoy rounds of golf for twenty-five followed by a VIP drinks reception overlooking TRAFALGAR SQUARE. Event available in the evenings on 16-21 September. Plus your name proudly displayed on PAUL SMITH’S “CLUBHOUSE” IN TRAFALGAR SQUARE and on our Wall of Fame webpage. 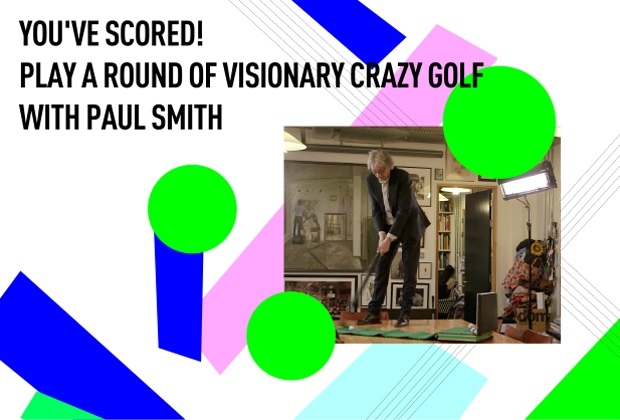 BE THE FIRST TO PLAY Visionary Crazy Golf with PAUL SMITH on the opening day. This is an exclusive opportunity to play a round with the master behind the famous designs. Tee off at 14:00 on 16 September. Plus your name proudly displayed on PAUL SMITH’S “CLUBHOUSE” IN TRAFALGAR SQUARE and on our Wall of Fame webpage. MEET PAUL SMITH AND TOUR HIS STUDIO. 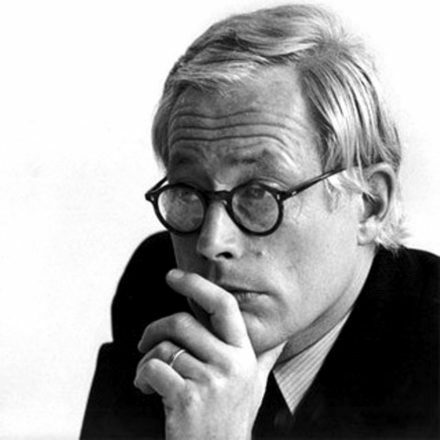 With a career spanning 4 decades, Smith famously created one of the most iconic design prints of all time. 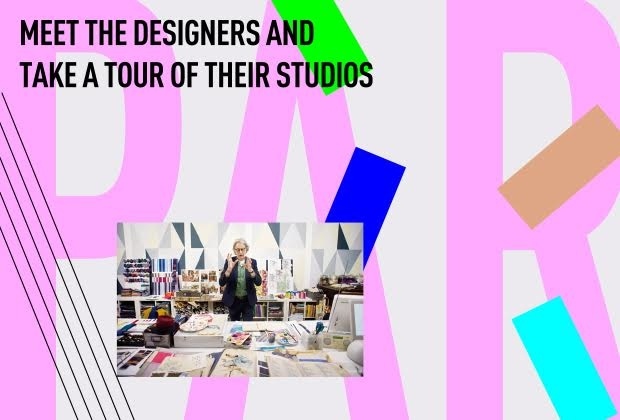 This reward offers the opportunity to MEET PAUL SMITH and take a tour of his studio with only five others. Tour to take place in the afternoon on September 23rd. Plus your name proudly displayed on our “CLUBHOUSE” IN TRAFALGAR SQUARE and on our Wall of Fame webpage.